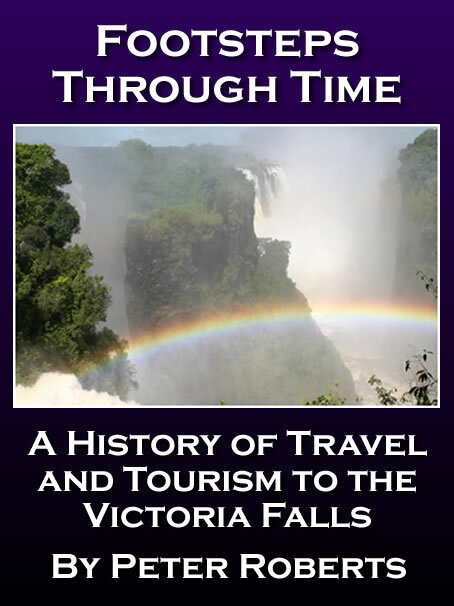 The following text is adapted from 'Footsteps Through Time - A History of Travel and Tourism to the Victoria Falls', researched and written by Peter Roberts and first published in 2017. Please visit the Zambezi Book Company website for more information. By the end of 1902, the rail line from the Cape to Bulawayo had been open for five years. The line from Harare to the sea at Beira in Mozambique was operating, and the two main centres of Harare and Bulawayo were also connected by rail. Sir Douglas Fox and Francis Fox started planning the railway to Lake Tanganyika and examining a descent from the Rhodesian plateau to the trough of the Zambezi through the spectacular Kariba Gorge. The country between Kariba Gorge and Lake Tanganyika was found unsuitable for the railway. But the discovery of large coal deposits at Wankie (Hwange) in 1893, with sufficient high quality coal to last 100 years, and only 200 miles (320km) north-west of Bulawayo, convinced Sir Charles Metcalfe that the route of the Cape to Cairo railway should proceed through to Wankie. He twice surveyed the country between Bulawayo and the Zambezi north of Wankie on foot in spite of the roaming wild animals and hostilities and reported that it presented few difficulties. The line would then continue to the Victoria Falls, cross the Zambezi by bridge and penetrate into North Western Rhodesia and the copper mines. In 1901 the Rhodesia Railways board under its chariman Cecil Rhodes, decided that a new railway should be built from Bulawayo through the Wankie district to link with the coal colliery, and then on to the Victoria Falls, crossing the Zambezi river below the Falls. The Wankie coal concession had been sold by the Mashonaland Agency Ltd to the Wankie Coal, Railway & Exploration Co in 1900. At the time coal was essential to the development of the country, which could no longer exist on the cutting of timber to feed the furnaces of its mines and railways. Apart from the coal traffic to be picked up, the route was easier than the planned crossing of the Zambezi lower down where it broadened out over a wide and deep valley with steep escarpments. The work was contracted in three sections. In 1901 work was started, once again by Paulings, on the first 161 miles of extension from Bulawayo north to Wankie, financed by Rhodesia Railways. The first section to be opened to traffic was from Bulawayo to Mambanje and ran through sand veld, well wooded with mopane and teak, and with the exception of the Umgusa river, was of easy grading and was fairly easy going for Pauling and his men. The country teamed with game, from small antelope to giraffe and elephant, with lion causing much anxiety amongst isolated railway staff. It was along this first section of line that the 72 miles of "long straight" was encountered, travelling from Gwaai to Dett. 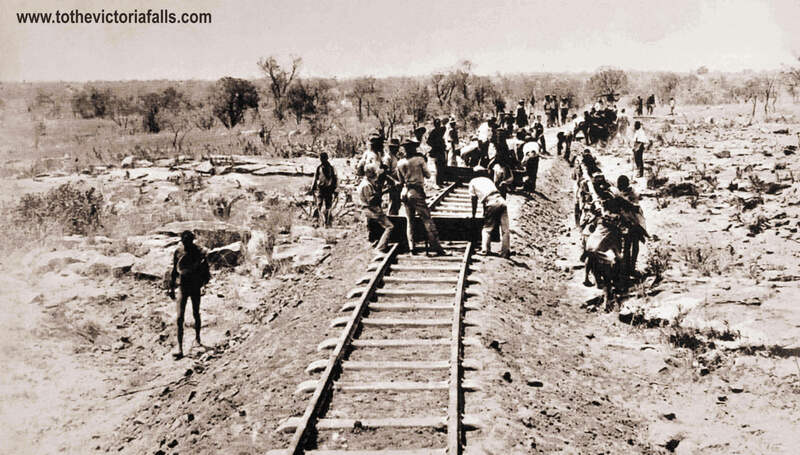 At the time of its construction it was the longest, straightest section of railway in Africa and probably the world. In later years, when electric headlights were fitted to locomotives, it was said that if one were to stand at the northern station of Dett, one could see the headlight of an approaching train in the distance an hour or more before its arrival. By March 1903 the line had been opened as far as Mambanje. From there the traveller who wished to see the Victoria Falls could continue his journey on horseback, his luggage following in a cart drawn by mules. The return fare was £24 and 6 shillings. While construction from Bulawayo proceeded, the route forwand from Mambanje to Wankie and then the Falls had been surveyed. Edward Rosher recalls that the heavily graded section between Dett and Wankie was some of the toughest country he had ever encountered for survey work and that it was reputed to be Livingstone's 'Valley of Death'. It was often a case of crawling on hands and knees along game trails to get through the bush and forest to reach a suitable spot where the bush could be cut back enough to allow surveying equipment to be set up. All this in a country rich in lion, elephant and other game, as well as the malarial mosquito and posionous snake. The line was extended for general traffic to Wankie on 1 December 1903 with the first train of Wankie coal having been shipped south in October, with the line still under construction conditions, such was the demand. By late 1903 the railway had reached Wankie, where onward passengers and mail were transferred to a Zeederberg coach service for the remaining 68 miles to the Victoria Falls. At the outspan there is no time to cook, not even at night. We unload the cart while the "leader" makes the fire and fetches the water. Then we make tea, coffee or soup in ten minutes, tear open a tin and divide the contents (first setting out our tablecloth on a box with plates and saucers), wash up and perform a hasty toilette. It was not nearly so hot on the return journey, a cool wind meeting us all the time; but we had so little luggage there was no ballast for the cart, and oh ! how we were thrown about! Sir Charles Metcalfe and Stephen F Townsend were both involved in the extension of the railway north, Pauling having received the contract for the next section to Victoria Falls. 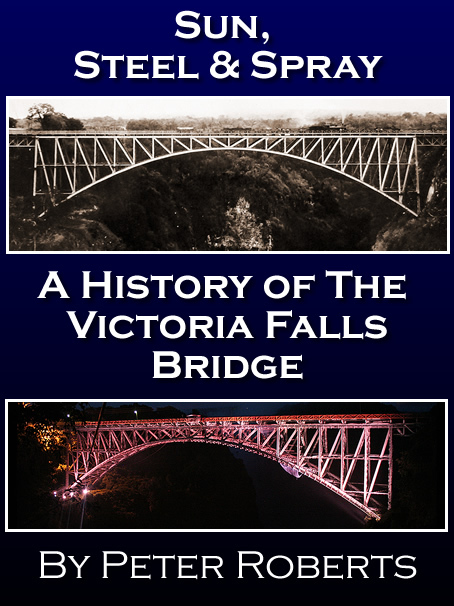 Extension of the line to Victoria Falls was begun in September 1903, financed by Rhodesia Railways, who were also responsible for the bridge to be built over the Zambezi and the continuation of the line into North-Western Rhodesia as far as Kalomo, the administrative centre. The 68 miles of line from Wankie had been particularly challenging for Pauling and his railway construction gang, and included 47 miles of very heavy work through difficult country. Two major river crossings were involved , one over the Deka, nine miles from Wankie, and the other was the Matetsi, about half way to Victoria Falls. For this a temporary trestle bridge, 260ft long and 43ft high, was built to carry the line forward. It was probably the biggest tressle bridge to be built by Paulings and was later replaced by a steel girder structure. Harold Pauling was once again in charge of this contract, and as usual, the work was efficiently pushed ahead. 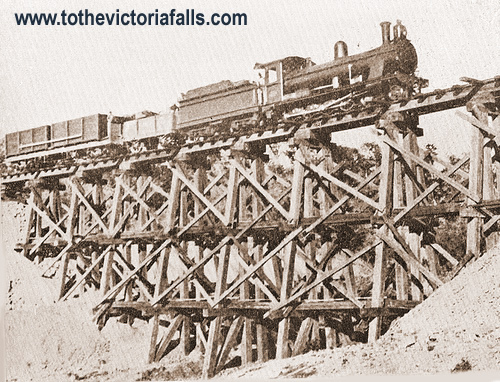 Despite the difficulties, the line to the Victoria Falls was completed on 24 April 1904, when Miss Blanche Pauling, Harold Paulings's daughter, and her friend, Miss Veale, drove the last half a mile of the first train to pull in at the then dead-end stop of Victoria Falls. The train was hauled by RR 7th class no 22, flying the Union Jack and supporting the banner "We've a long way to go", referring to the ultimate planned destination of Cairo. As soon as the last sleeper was laid and the train came to rest, celebrations began, with a feast for all the staff engaged on the work. 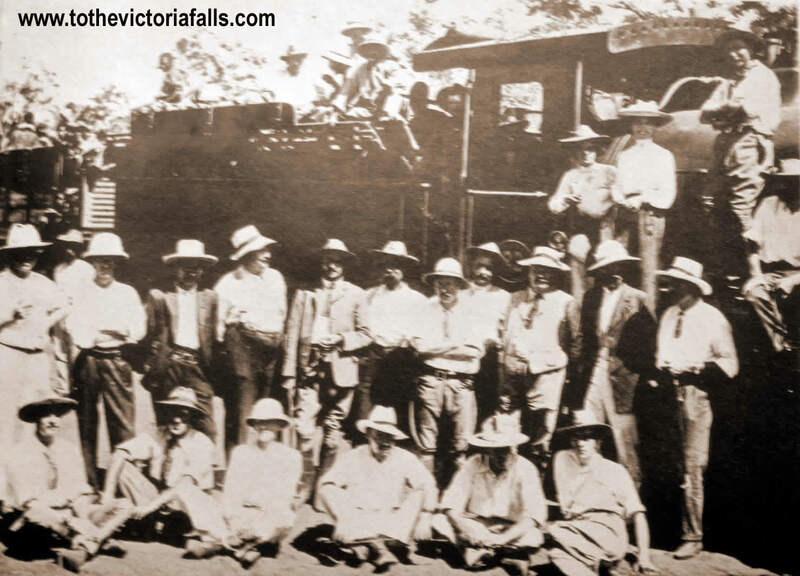 The first train to arrive at Victoria Falls on the 24 April 1904, RR 7th Class No 22. Group includes Harold Pauling (standing 3rd from right) and his daughter Blanche (in white blouse). In May 1903 Percy M Clark (no relation to 'Mopane' Clarke) had moved from Old Drift to settle on the south bank of the Zambezi River to await the coming of the railway. He was the first resident of Victoria Falls Town, and lived in the area until his death in 1937. He quickly realized that he could use his photographic skills to generate a tidy income, and in his autobiography he tells of his first successes in taking photographs of the occasion and selling them at five shillings each to all the engineers, contractors and railway staff present. The distance from Cape Town was 1,641 miles, and only twenty years before it took over 6 months’ trekking with oxen to get to the Falls. Now the distance was easily covered in a few days. From 10 May 1904, Paulings started public traffic between Wankie and Victoria Falls, running two trains a week for people anxious to see this 'Wonder of the World'. The line was officially taken over for traffic on 20 June 1904. The first group of tourists known to visit the Falls on a through train from Cape Town was a party of 37 friends organised by a Mr Arderne, a businessman based in Cape Town, who hired the railway's Train de Luxe, complete with refridgerator truck and dining car. 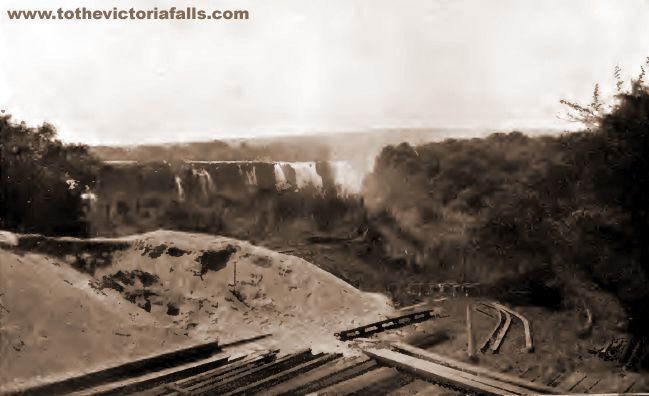 The party arrived at the Falls in late June 1904, with the banner "First through train - Cape Town to Victoria Falls". 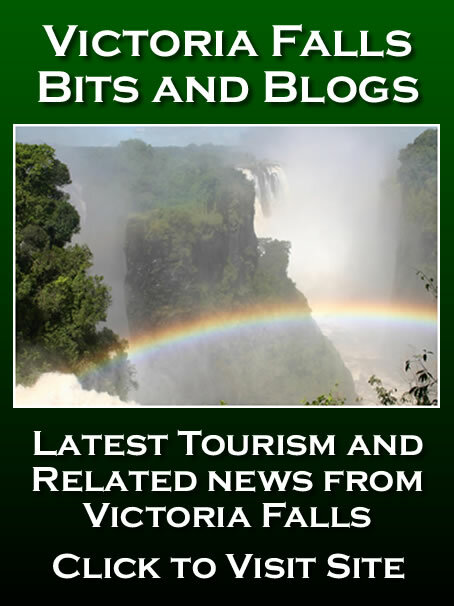 They stayed six nights, and such was the luxury of the train that the party ate and slept aboard and did not use the facilities of the newly opened Victoria Falls Hotel. A descriptive and illustrated account of this inagural tour was privately published in Cape Town as a souvenir. The Victoria Falls Railway Station was ready for opening in mid June 1904 and the post office within the building was open by August. The Station Master was Mr W T Breach. In July 1904 Rhodesia Railways offered reduced fare introduction tickets from Bulawayo at £5 5s first class and £3 10s second class. In advertisements it was stressed that passengers must provide their own food (there were no dining cars) and blankets and they were warned that there were no intermediate stations where refreshments could be obtained. The trains took 22 hours on the Bulawayo to Victoria Falls journey and 24 hours on the return. Pierre Gavuzzi, a Bulawayo hotelier and manager of the Grand Hotel, provided hampers. He was later to run the Victoria Falls Hotel as well as the dining-car system for the Railways. By June 1905 three passenger trains a week were running to and from Bulawayo. Also featuring on the Rhodesia Railways timetable was the "Zambezi Express" - a through train from Kimberley to Victoria Falls which completed the 450 km trip in under 18 hours, fully equipped with bedding services and dining car. All passengers were handed an Annotated Time Table of the Zambezi Express on the Rhodesia Railways, which gave details of the times at the stops en route in both directions, and interesting information and photographs on the places passed. "A First Class Saloon for Victoria falls leaves Cape Town on the 11.30 a.m. train on Tuesdays, and is attached to the Zambezi Express at Kimberley. It reaches Victoria Falls Station at 7.15 a.m. on Saturday. It is luxuriously appointed, and includes showerbath, etc. The distance from Cape Town is 1,642 miles [2,650 kilometres], and the return fare UKP23:16:8d. 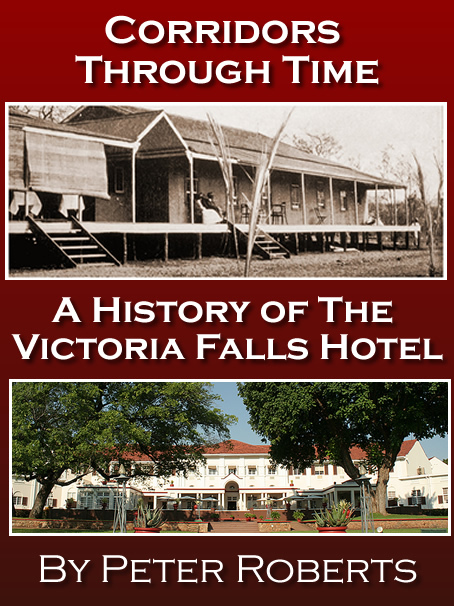 Terms at Victoria Falls Hotel, 21/-a day." In contrast to the hampers passengers had to carry on the first service to the Falls, passengers could lunch in the fully serviced dining-saloon. The menu constsited of: Tomato Soup; Boiled Kabaljoe with parsley sauce; Haricot Mutton; Roast Ribs of Beef; Assorted Vegetables; Cold York Ham and Roast Beef; Chicken and Tounge; Dressed Salad; Tapioca Pudding; Stewed Fruit; Cheese and Biscuits; and Black Coffee. The railway company quickly dispatched materials for the construction of a temporary hotel, the initial purpose of which was also to provide accommodation for the engineers working on the construction of the bridge. They quickly erected a wood and iron building, raised from ground level to allow ventilation and freedom from pests and dampness. The Victoria Falls Hotel opened in June 1904 and proved to be a popular watering hole for the rail and construction workers, with many an evening described as "lively". "In the Victoria Falls we possess a very valuable property, which is likely to promote materially the prosperity of the country. During the short period in which the railway to the Falls has been open, a large number of visitors has been attracted to them, and the tourist traffic which may be legitimately expected in the immediate future is likely to increase..."
It may be that with the advent of railways and hotels this element of romance will disappear, but at present it still survives. The Victoria Falls are now the meeting-place of civilisation and the desert, and this gives a certain charm to the everyday life there. At first sight it seems to be almost too 'civilised' — the new hotel, the Canadian canoes, the crowds of camera-laden visitors, or the scene of bustle and activity at the railway station and the bridge head, all appear singularly out of place; indeed the Victoria Falls have been described by one who knew them in the old days as ‘a mass of water surrounded by tourists.' But in the rainy season it is very different, for the only inhabitants then are a few officials, and enterprising traders, content to endure the feverish climate of the Zambesi valley. During the last rains two lions were killed within a few miles of the Falls, and from time to time travellers appear, laden with sporting trophies, or shivering with fever, from the illimitable interior; some have come from the new copper fields, others from further north, from Tanganyka or the Congo, with a thousand tales of travel and adventure. It is of course inevitable that the great power known as 'Civilisation' should soon extend her realm beyond the Zambesi, and it is now clear that she will set her mark upon the Falls themselves, for already there is a hotel, a railway station, cuttings and embankments, and watering-places in close proximity, and it has been necessary to surround the 'rain forest' with a wire fence. Within a year it is said that the passengers by the Cape to Cairo railway will cross by the new bridge, less than two hundred yards distant from the Boiling Pot, with the spray beating on their faces, and the roar of the waters in their ears. It is the bridge that is regarded as mainly responsible for all this, for when the present site was chosen it meant not only that the Falls should be accessible, but that all the accompaniments of civilisation should be deposited at their very edge. During the past year the choice of the site has been much criticised upon these grounds, but now that the bridge is more or less a fait accompli further discussion is useless. It has, however, served to open the wider question of what is to be the future of the Falls. It is of course within the bounds of possibility that they should simply be 'exploited' as one of the commercial assets of the country; indeed, one argument used in favour of the bridge was that it would give to visitors in the future a view of the Falls which was previously unobtainable. And if this attitude is taken their fate is sealed. But it is more probable that they will find in public opinion an ally strong enough to defend them against further desecration. In England a storm of indignation is aroused by a proposal to destroy an old bridge, or to build a railway up a mountain, and the sentiment which inspires it should be able to preserve the natural beauties of a scene, which may fairly claim to be considered one of the wonders of the world. 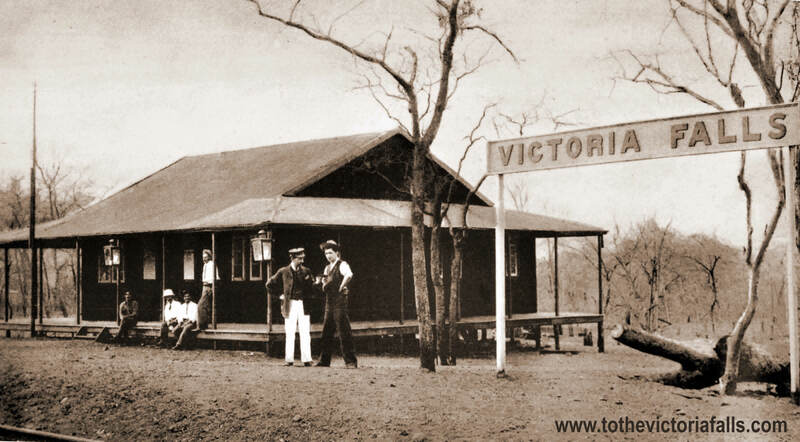 Arrival at Victoria Falls - the original railway line ran in front of the Victoria Falls Hotel, being replaced with the current routing behind the hotel after floods during 1908/9 caused subsidence. Hyder Consulting (2007) Footprints on a Global Landscape – 100 years of improving the built environment. Hyder Consulting. Varian, H F (1953) Some African Milestones Wheatley : George Ronald. 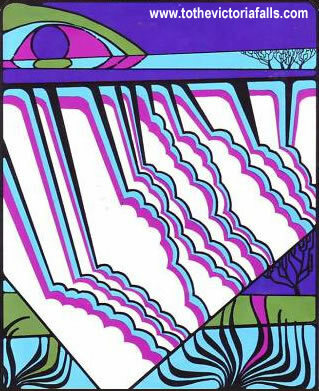 (Reprinted 1973 Books of Rhodesia).